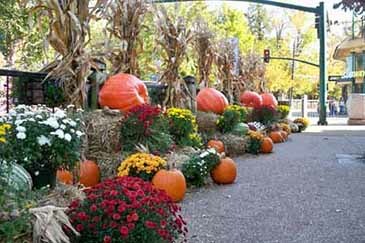 The rich culture of Great Smoky Mountains National Park is shared in numerous festivals and special events throughout the year. Music, storytelling, arts and crafts, homemade remedies, mountain food preparation, and history are part of events that are free and open to the public. door offerings are held in various venues throughout Gatlinburg, TN. 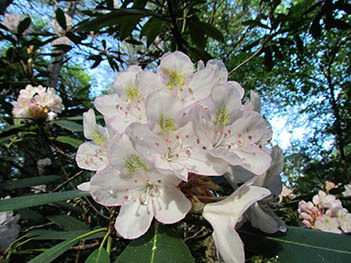 This annual festival is held at the Cosby Picnic Area and Amphitheater in Great Smoky Mountains National Park. “Celebrating Cosby” will honor the rich cultural and natural history of the Cosby area. Join park staff and community members in celebrating Cosby through the programs and in discovering new opportunities to enjoy this section of the park. Programs topics will vary each week, including mountain music, moonshiners, storytelling, sunset and lantern hikes, farming and orchards, clogging, cooking, and more. The first program on June 22 featured local banjo player, David McClary, who played claw-hammered style banjo music. On June 29, Mark Ramsey, Digger Manes and Friends will share stories about moonshining. The July and August schedules will be available at the Sugarlands Visitor Center. In the event of rain, “Celebrating Cosby” programs will move to the covered picnic pavilion adjacent to Cosby Campground. Programs will be held rain or shine. Visitors are welcome to find seating in the amphitheater or bring their own chairs or blankets. Great Smoky Mountains National Park provides former Cades Cove residents, their descendents, and others from surrounding areas an opportunity to take part in Old Timers Day. Storytelling and reminiscing are also featured during this informal affair. Visitors are welcome to join in and contribute stories of their own. One of the most unique areas in Great Smoky Mountains National Park, Cades Cove, an historic valley rich in pioneer culture as well as bountiful in wildlife, hosts Old Timers' Day and molasses making in September of each year. Former Cades Cove residents, their descendents, and others from surrounding areas take part in this event. Storytelling and reminiscing are also featured during this informal affair. Visitors are welcome to join in and contribute stories of their own. The event is held in Cades Cove. The Cades Cove Loop Road opens at sunrise to motor vehicles and Park Rangers are on site to coordinate parking. Over 4,000 people attend this annual get-together. The free event will take place in the Cable Mill Visitor Center area. Visitors are encouraged to stay all day and bring lawn chairs and a picnic lunch. Old Timer's Day provides visitors an occasion to listen to the sounds of traditional mountain music. Experience an old-time mountain Christmas celebration at the Oconaluftee Visitor Center. Park staff and volunteers will provide hands-on traditional craft demonstrations from 10:00 a.m. to 12:30 p.m. Children and adults will have the opportunity to make a corn shuck doll, buzz button, and cinnamon ornament to take home. Visitors will be encouraged to make a cinnamon ornament to hang on the visitor center tree for years to come. An acoustic old time jam session will take place from 1:00 p.m. to 3:00 p.m. with a focus on holiday music. Hot apple cider and cookies will be served on the porch with a fire in the fireplace. The Center is located on Newfound Gap Road (U.S. Highway 441), two miles north of Cherokee, N.C. All activities are free. Music of the Mountains tells the story of music in the Southern Appalachians through its diverse history. Performances will be held in surrounding communities and in the park, telling the story of how mountain music grew out of traditional Celtic and religious roots to become something that would be played on front porches all over the Smoky Mountain region. 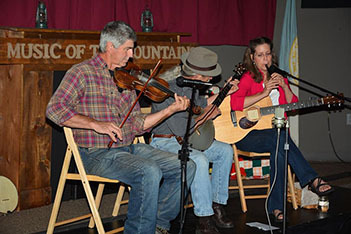 Held on selected Saturdays, the Cosby Mountain Music is a series of "old-time" mountain music presentations at the Cosby Campground amphitheater on Saturday evenings during the summer. Performances for this free event begin at 7:00 p.m. and last an hour and a half. Bands play traditional songs and tunes, utilizing the fiddle, claw-hammer banjo, and guitar. Along with their playing, band members will provide information on the origins of the songs and tunes of southern Appalachia. 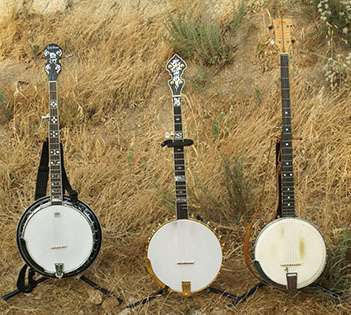 Other bands feature performers on claw-hammer banjo and acoustic bass playing traditional music of the southern mountains. One of the goals of the band is to share their enthusiasm for mountain music through song and story, thereby promoting the cultural heritage of this part of southern Appalachia. Both bands have produced CDs and regularly perform at many music venues in the region. For more information, please contact the Sugarlands Visitor Center at 865-436-1291. Image courtesy of www.folk-legends.net. 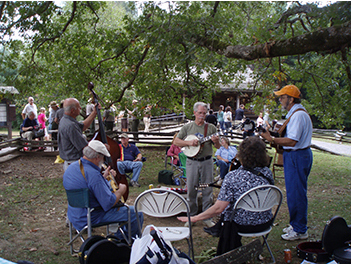 This Festival, held at the Mountain Farm Museum near Cherokee NC, provides an opportunity to share with park visitors some of the traditional fall activities that were an important part of rural life in the southern mountains and reflect the spirit of cooperation that existed among families and neighbors. Demonstrations include hearth cooking, apple butter making, sorghum syrup making, blacksmithing, lye soap making, food preservation, and chair bottoming. Artifacts and historic photographs from the national park's collection will also be on display. A sorghum syrup making demonstration has been the centerpiece of the event for over 30 years. The syrup is made much the same way it was produced a hundred or more years ago, using a horse-powered cane mill and a wood-fired cooker. 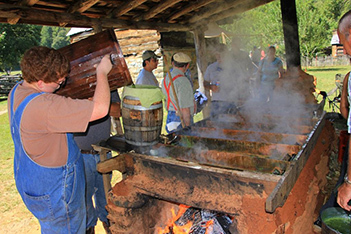 The syrup making demonstration is provided by students, staff, and volunteers from Swain County High School Future Farmers of America through a cooperative agreement with Great Smoky Mountains National Park and the Great Smoky Mountains Association. In addition to the Mountain Life Festival events, visitors will also be treated to music jam sessions which are held on the porch of the Oconaluftee Visitor Center every first and third Saturday of the month from 1:00 p.m. to 3:00 p.m. The Mountain Farm Museum is located adjacent to the Oconaluftee Visitor Center on Newfound Gap Road in Great Smoky Mountains National Park, two miles north of Cherokee, North Carolina. Festival of Christmas Past features a series of hands-on workshops, demonstrations, and musical entertainment and is made possible through the cooperative efforts of many Park friends, including the Smoky Mountains Historical Society and Great Smoky Mountains Natural History Association. The festival provides an atmosphere of Christmas holiday cheer as many Park friends gather to share their reflections on mountain lifestyles through conversation, storytelling, music, and demonstrations of domestic arts and food preparation. It's a great opportunity for visitors to learn about mountain folk ways and how Christmas was celebrated in a traditional fashion. The day's activities take place at Sugarlands Visitor Center and the Sugarlands Training Room, the building adjacent to the visitor center. 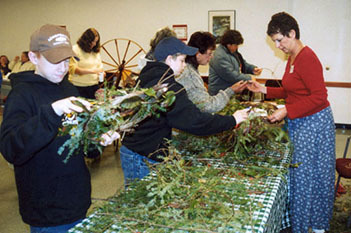 Several hands-on activities take place all day. Artisans demonstrate basket making, spinning, and weaving, while others share their knowledge on woodworking and how homemade remedies, chores, and foods were traditionally prepared. The Christmas craft table is always a favorite with youngsters and adults alike. Park volunteers are on hand with the help of Vickie Law to lend their time teaching the art of making gifts and decorations from natural items and inexpensive materials already on hand. Participants can make their own decorations to take home with them. In the Visitor Center auditorium, renowned storytellers begin the program with a few tales, bringing humor, history and holiday spirit to the event. Performing throughout the day is a variety of musical entertainers with sounds of traditional gospel and mountain music and old fashioned Christmas hymns and carols. 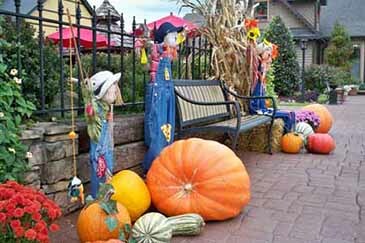 Fall is a wonderful time of celebration in the Smoky Mountains. The annual Harvest Festival brings arts and crafts fairs, music celebrations, and lots of fun activities to enjoy during your stay. Each city surrounding the national park has its own flair for celebrating this time of year. This Festival is a celebration of the human history, natural beauty, and cultural traditions of Townsend, Cades Cove, and Great Smoky Mountains National Park. The event involves many community groups and businesses and Great Smoky Mountains National Park. It is free, except for lunches and suppers, where there are reservations required, with charges for meals or material fees. Music and photography workshops require pre-registration. The Annual Fall Smoky Mountain Trout Tournament is open to adults or children – and equally challenging for both visitors and locals. All Gatlinburg and state fishing regulations will be observed. The festival will include fiber animal exhibitions, marketplace of vendors, classes, educational demonstrations of spinning, weaving, needlecrafts, dyeing, and many other fiber processes, hands-on projects with children and adults, local artists' work and fiber craft supplies, and information about local fiber activities, groups, businesses, and instructional resources. Featuring a selection of the nation’s finest potters, this festival offers the opportunity to view and purchase different styles of pottery and other goods made of clay. Clay Art connoisseurs and novices are invited to enjoy the pieces of art in the historic village at the Heritage Center. This is a perfect time to learn from and discuss different styles and forms of pottery with the expert potters. The Tennessee Pottery Festival is a unique opportunity to find the perfect piece of custom clay art for your home. Whether it is for decoration or function, this festival will have something for everyone at a wide range of price of art as unique as the state of Tennessee. Townsend Visitors Center, Trillium Cove Shopping Village and other locations around Townsend. A celebration of Appalachian history and crafts, bluegrass music, wildflower walks, storytelling, BBQ, clogging, the Young Pickers Contest, book signings, bake sales, and much more! FREE admission. $8 parking per day( goes to Volunteer Fire Department). NO PETS. Begins at 10 am daily. Quilters from various states come together to attend classes that are based on skill level and technique. There is also a quilt show that displays a large variety of quilts. Spend your family vacation in the middle of Great Smoky Mountains National Park. Surround your family with the magic of the mountains as you hike ridges, study wildlife, explore secret places, and take afternoon dips in the Middle Prong. This week-long adventure is designed for families that are ready to leave their cares behind in exchange for a week of unending family fun. Each day brings new activities in which to choose; hike in the high country, explore Cades Cove, search for salamanders, and enjoy fantastic evening entertainment. Registration required. Great Smoky Mountains Heritage Center. 865-448-0044. Now in its 12th year, this annual celebration of the old-fashioned county fair features competition, games, music, historic demonstrations, and more. Cades Cove is one of the most unique areas in Great Smoky Mountains National Park. This historic valley is rich in pioneer culture and is bountiful in wildlife. The Cove hosts Old Timers' Day and molasses making in September of each year. Former Cades Cove residents, their descendents, and others from surrounding areas take part in this informal event. Storytelling and reminiscing are also featured. Visitors are welcome to join in and contribute stories of their own. Old Timer's Day provides visitors an occasion to listen to the sounds of traditional mountain music. The Cades Cove Loop Road opens at sunrise to motor vehicles, and Park Rangers are on site to coordinate event parking. Over 4,000 people attend this annual get-together. Visitors are encouraged to stay all day and bring lawn chairs and a picnic lunch. Townsend Visitors Center & Cades Cove. 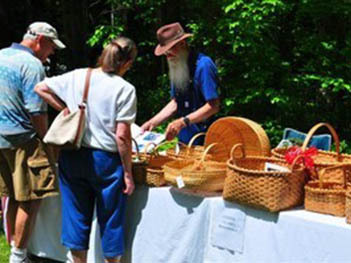 Celebrates mountain and Appalachian arts and crafts. Features demonstrations, bluegrass and mountain music, an antique tractor and engine show, storytelling, children’s activities, crafts by local artisans, basketry, spinning, weaving, sorghum molasses, apple butter making, lye soap, beekeeping, and blacksmithing. 9 am-10 pm daily. 800-525-6834. This popular annual show and competition sponsored by the Smoky Mountain Woodcarvers Association, Smoky Mountain Woodcarvers Supply and the Great Smoky Mountains Heritage Center will take place on May 7th and 8th. Hours for the show are Saturday from 10:00 a.m. to 5:00 p.m. and Sunday from Noon to 4:00 p.m. Public admission is $4.00 per person. More than 300 entries are expected from woodcarvers from at least 6 states with categories of competition in Novice, Intermediate and Open with winners receiving ribbons and cash awards. Woodcarvers will be set up onsite to offer demonstrations or to display and sell their carvings. Woodcarving tools, equipment and teaching aids will also be available to purchase during the festival. The 19th Annual Fall Smoky Mountain Trout Tournament is open to adults or children – and equally challenging for both visitors and locals. All Gatlinburg and state fishing regulations will be observed. Climb mountains, ford streams and leave your hectic lives behind. Join National Park guides and experience the beauty of the Great Smoky Mountains firsthand on a three-day backpacking adventure. Registration required. Celebrate harvest, home, and the holidays with live music throughout the day, kids’ crafts, tasty treats from the open hearth, basket weaving demonstrations, guest speakers, and more. 10:00 – 5:00 Fun fall activities for the kids: Make old fashioned Christmas tree ornaments to hang on your tree, learn how baskets are made, taste yummy homemade fudge made over the open fire, and best of all visit with Santa Claus! 10:00 – 4:45 Live music in the auditorium will be provided by local musicians. Please check our website for the final schedule for the day and for all updates. Come celebrate holiday traditions of the past and begin new traditions that bind the hearts of family and friends. Admission is free.